sailboat. : This Weekend #8: Violet & Ted! 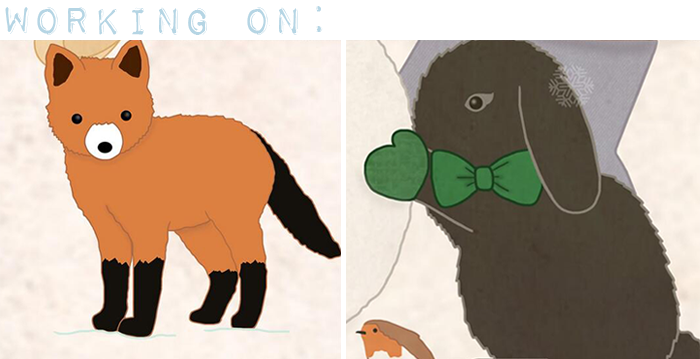 A sneak peek from our upcoming Violet & Ted miniature Christmas story! Time has completely run away from me this morning and if I'm completely honest, the whole of this week too! I'm so happy that it's the weekend though, I'm currently tucked up in bed working on the Violet & Ted short Christmas story that Carly and I will be releasing next Friday. We've been beavering away for the last few months, coming up with ideas we'd like to explore and although we didn't quite have the time to create a full Christmas story, we're really excited to share what we have created so far. Since my last post, the little white bunny found the most wonderful name. We kept a note of all your suggestions and there were so many we loved, it took us a really long time to choose. In the end though, we thought that Gaelle's suggestion of Dandelion was completely perfect! We don't entirely know what we're doing or where, if anywhere, Violet & Ted will go, but we've been having so much fun with it and learning a lot along the way! And I think that's the most important part. I'm also partly beginning to think that Carly is my long lost (waaay more artistic & talented!) twin, we have so much in common and it's been a real pleasure to get to know her a little more! Weekends in the run up to Christmas on ITV are all about the Harry Potter series. The Prisoner of Azkaban is one of my favourites I think, I've got a lot of love for Sirius, Lupin & of course Beaky! Other than than though, I've not been watching very much - I'm trying not to spend so much time watching shows, I've had an almost entirely TV free week and I've not felt like I've missed out on very much at all. And we didn't make it to the cinema in the end. It's a very long story about a supermarket trolley and a pound coin, but that's for another time...! Are you having a lovely weekend so far? Have you had any exciting plans? This sounds exciting! :) I hope to hear more of Violet and Ted soon! Oh, they are sooo cute. Looking forward to seeing the full story next Friday! I love that they play Harry Potter in the lead up to Christmas, Netflix has been lacking on the Christmas movie front so it gives me something good to watch. I can't where your Violet and Ted adventures go! I can't get over how young they all are in that photo! I'm REALLY excited to read your Christmas story! You girls are both so talented. Dandelion is the perfect name!